I have never made an online purchase before - how can I be sure Braverman Jewelry is reputable? Buying jewelry online for the first time can be quite a daunting process for some people, which is why we strive to be the most open, approachable and informative online family jewelers working today. We welcome any questions or queries, and will strive to give you full, honest answers every time. If you have any doubts, don’t hesitate to look through our extensive feedback, from our happy, highly satisfied customers and ‘Braverman Family’ members. Should you wish, we can even put you personally in touch with one of our satisfied customers, who will be only too happy to inform you of their buying experience with Braverman Jewelry. Why should I choose Braverman Jewelry? There are countless reasons why our workshop is the best choice for all your jewelry needs, just as there are countless reasons why our customers return to us and our services time and time again. We offer a level of personalized care which is second to none, and are dedicated to removing the intimidation of jewelry buying through guiding our customers through the purchasing process step by step. On top of this, we promise that all of our precious metals and gemstones are hand-selected to ensure the highest levels of quality at the most affordable prices. Variety and choice is at the very heart of what we do, and as such we offer endless opportunities for customization and adaptation - a wide selection of quality gemstones, a mix-n-match service bringing together wonderful components which will always result in truly stunning items of jewelry, and the possibility to have your jewelry custom made by Oren Braverman our designer. We’re so confident that you will love our unique and beautiful crafts that we offer all of our valued customers the opportunity to return or exchange their items within thirty days of purchase, should they be in any way unsatisfied with what they receive. In order to be eligible for return, and for the return to be accepted, it must be shipped in the original purchase condition, with all purchase documentation within 30 days of being bought. Can any of your items not be returned? Certain items are not eligible for return. These include custom-made items, engraved pieces of jewelry, items sold at a special discount or diamonds purchased as part of our diamond upgrade offer. My item was given to me as a gift. Can I still return it? Of course, we are happy to offer credit in exchange for a gifted item. As with any returns, it will need to be sent to us in its original purchase condition, with any original packaging. Your refund will be issued in the form of a Braverman Jewelry gift certificate for the purchase value. Will the person who bought the returned gift be informed of the return? If you do not want us to say anything, just let us know - your secret is safe with us! How should I package my returned item? It’s important that your return reaches us in the same condition it was sent in. Please contact us regarding this, and we can give you some pointers to ensure that no damage occurs in transit. We like to give our customers the best deal possible, and one of the best ways of staying on top of promotions and discounts is to join the Braverman Jewelry mailing list. This will keep you up to date with all of our news, and also let you know when we are running a promotional offer or discount code. We also offer a discount for those who wish to pay by bank wire. Once you’ve paid for your item, and your item has been processed for shipping, we will email you your confirmation and information about tracking your order. This will allow you to see how your item is progressing, and help you know when to expect your special delivery from our workshop. Are there any additional taxes to pay? While we do not collect any additional taxes, international sales may be subject to import duties. You will be contacted by your local customs authority should you need to pay anything extra. How are Braverman Jewelry orders shipped? We believe in providing the best and most affordable service for all of our customers. As such, all of our shipping is free of charge. Expedited services may incur an additional fee - if you need more information about this, don’t hesitate to get in touch and ask. Does Braverman Jewelry offer a warranty? At Braverman Jewelry, we are 100% committed to providing the absolute finest customer service in the industry. Part of this involves all of our jewelry coming with a lifetime warranty concerning manufacturing defects, meaning you can rest at ease in the knowledge that we deeply care about the quality of our produce. Please bear in mind our warranty does not cover general wear and tear, damages incurred by trauma to the item, negligence or lack of care and maintenance. It also doesn’t cover theft or loss of the item. How long do I have to wait for my item to be made? While we will always try to get your items of fine jewelry to you as soon as we can, unfortunately, there is no fixed time for the completion of our hand crafting process for each piece. If your piece is custom made, you can expect to wait a little longer - but we will always keep our customers informed as to when to expect the arrival of their orders. Designs made of titanium, tungsten and any other unique metal can take several weeks, so please bear this in mind when ordering. Should you need your piece much sooner than we suggest, do get in touch - it is possible that we will be able to make it more quickly for you if needs be. Can I buy loose diamonds from Braverman Jewelry? Yes, our diamonds are available for purchase as loose items. Just get in touch and let us know what you are looking for. Can I get my Braverman Jewelry rings resized? We understand that it sometimes happens that rings are bought in slightly the wrong size, or that rings sometimes don’t fit as you expect them to. As we are committed to ensuring that all of our customers receive the highest levels of service from Braverman Jewelry, all of our gold and platinum rings can be resized once free of charge. However, because of the limitations of materials and design, some of our rings cannot be resized. At present, we are not able to resize rings made from alternative metals, custom-made rings, or ornately made, milgrain rings. We also cannot resize rings which feature certain numbers of accent gemstones on the band. Are the gemstones you feature on the website the only ones you offer? Being custom designs experts, Oren & Erez Braverman can provide any gemstone you wish. Please speak reach out should you want a gemstone piece of jewelry not featured on the website. 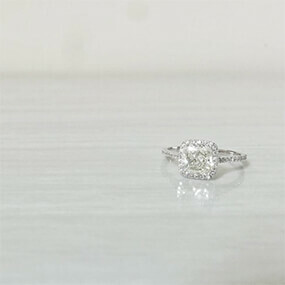 We can also offer alternative center stones, too - just ask, and we will see what we can do. After all, we pride ourselves on the ability to do absolutely anything and everything for our customers! What can I do if I want a center stone which isn’t offered for a particular setting? All you have to do is ask, and we’ll see what we can do for you. Many of our settings can be modified in order to fit different gemstones or different shaped stones - just get in touch and ask! Will you help me design a custom piece of jewelry? We specialise in custom made jewelry, and Oren is ready for any design, and any challenge! We will be with you step by step through the design process, and will be happy to make any item of jewelry you can dream of. Can I request small changes to the items of jewelry featured on your site? We always strives to meet all of our customers expectations. As part of this commitment, all of our items of jewelry are made to order, meaning we are always happy to hear from customers who are interested in customizing our designs. 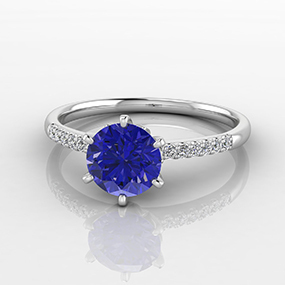 We will be delighted to adapt our jewelry to your specifications, whether this involves changing the gemstone, adding a new setting, or anything else you desire. Can my order be expedited if I need it sooner? We understand that sometimes, time is of the essence. If you need your product expedited, get in touch with us and we can discuss the options regarding speeding up production and delivery for you. Am I able to purchase multiple items for comparison purposes, and then keep only the piece I like the most? We do not allow our customers to purchase multiple items for the purposes of comparison, in order to keep our crafting smooth and our prices as low and competitive as possible. We are highly knowledgeable when it comes to all aspects of our range - if you need to ask any questions, or wish to learn more in order to accurately choose the best item for yourself, don’t hesitate to contact us. Are all of your gemstones natural? Do you use any synthetic gemstones in your items? We take a huge amount of pride in the quality of all of our produce, and we are happy to say that 100% of our gemstones are certified genuine, and came from reliable sources. Across the jewelry industry, it is normal practice to heat-treat gemstones in order to enhance their natural beauty, and further bring out their unique colours. We sometimes use heat treating, wax and oil infusions in our gemstones. If you want to know more about our policy on treating gemstones, please get in touch. 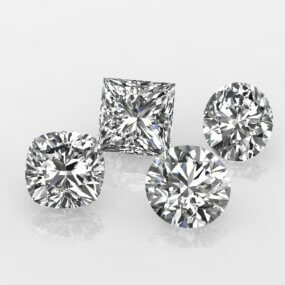 Are your diamonds modified or treated in any way? We only deals with and sells diamonds which are 100% naturally and completely untreated. None of the leading gemological institutions will issue grading reports on diamonds which have been treated, and as all of the diamonds we use are certified by leading gemological bodies, you can rest assured that our diamonds are totally natural and a perfect example of nature’s beauty. How do I know the diamonds Braverman Jewelry send me are the same diamonds I ordered? Every diamond that we ship comes with a lab report from a leading gemological institution. This report maps out the unique features of your diamond, and if you have any doubt as to its authenticity, you can take it to any independent jeweler’s for inspection and a guarantee that it is that which you ordered. If you have any questions about this, or anything connected to the way we work with high quality diamonds, we welcome your call.